Everybody loves unicorns! 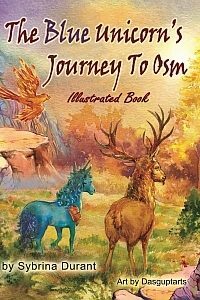 OK maybe they don’t but for those who do, they will love this fantastically illustrated story about a little unicorn who was born into a tribe of magical, metal horned unicorns. The little guy has no magic and he has no metal but somehow he must save the tribe from an evil sorcerer. Read this book for teens and older readers to find out if he can do it. This chapter book is a collector’s dream containing page after page of lavish artwork. It contains nearly 100 pages of story text by Sybrina Durant plus the same number of pages of magnificent water-color illustrations by Dasguptarts. It offers readers a visual feast of over forty beautiful water-color pictures that each span two pages. Forty-two – easy to digest two-page chapters are chock full of adventurous and entertaining morsels. This illustrated book will become a favorite of teen and older fantasy readers.